According to a January Austin Business Journal article, its official attendance in 2017 was 450,000, squeaking past SXSW, which had 421,900. 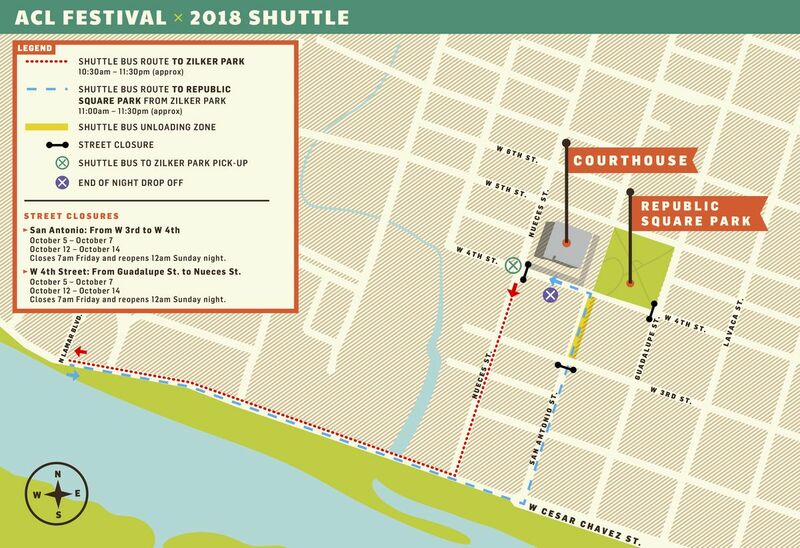 While it’s unlikely that the traffic nightmares around the festival and several surrounding areas will be abated entirely anytime soon, expanded transit options and festival organizers have combined to make getting there and back less of a headache—and, hopefully, lessened the irritation involved for non-attendees/average citizens to avoid the whole mess while going about their business. 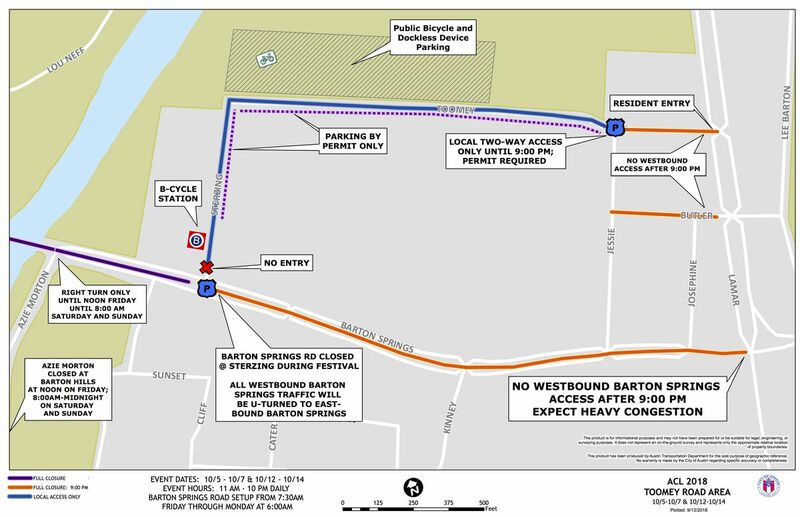 The following information should be helpful for anyone attending the festival or trying to avoid it all together! The ACL Bodega is a one-stop shop where you can buy quick snacks, like fresh fruit, and festival survival necessities, like sunscreen and ponchos. Stop by the Bodega near ACL Eats and the ACL Wine Lounge. Don’t let dehydration get the best of you. Make CamelBak Filling Stations a regular stop. Bring in an empty water bottle (plastic or aluminum) and don’t forget the sunscreen (just not the aerosol kind)! Stay on top of your game! Don’t miss out on the Barton Springs Beer Hall, where you can choose from different craft brews and catch the weekend’s biggest MLB, NFL and College Football games on the jumbo screen in between sets. Do you want a safe and secure place to store your things while you enjoy ACL Fest and keep your phone charged? We offer 3-Day, 2-Day and 1-Day rental lockersavailable near the Barton Springs festival entrances so you can free up your hands and avoid losing any personal items during the show. Click here to reserve your locker in advance to secure the best available pricing. Bringing a chair with you too? No problem, a complimentary chair check offered by U.S. Fund for UNICEF, putting children first all over the world, will be available near the lockers! Speaking of which, as you explore different parts of the park, please be mindful of the No Chair Zones. Help us help YOU enjoy more of the show by keeping these pathways and areas free of obstacles. 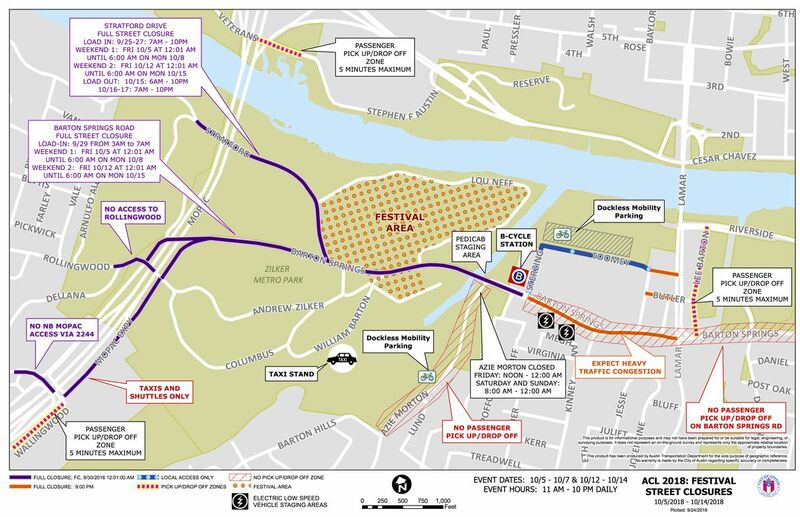 Street closures around the festival have a kind of hierarchy, depending on the kind of vehicle. 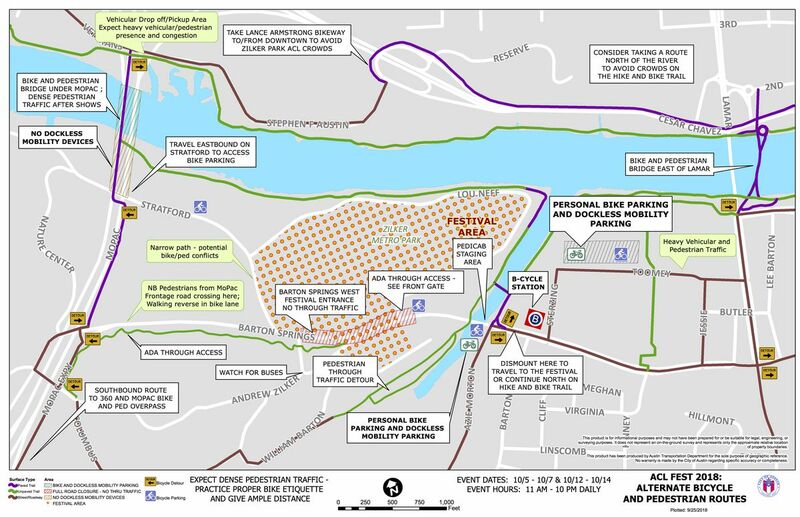 The map above shows different areas for taxi, shuttle bus, dockless vehicle, B-cycle, and pedicab access, stands, and parking, as well as pick-up/dropoff zones for private vehicles. 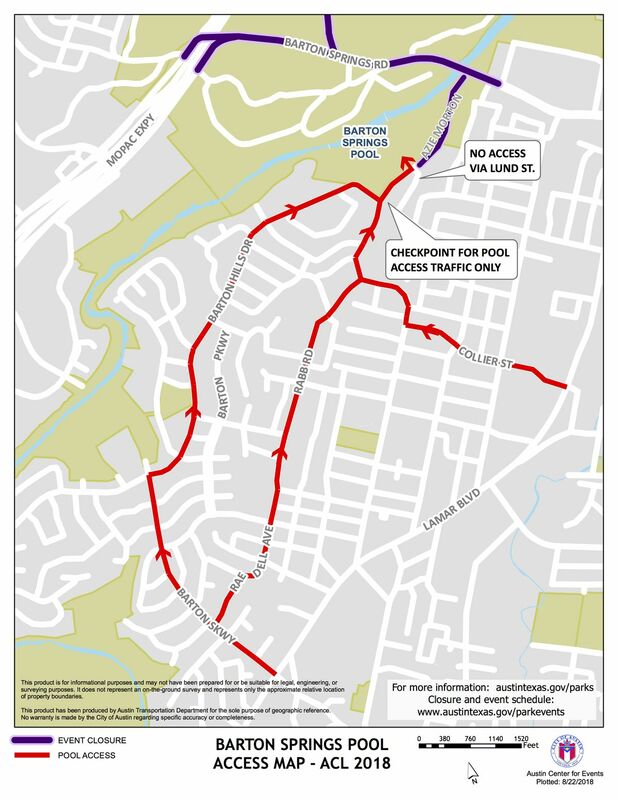 There are also maps of access routes and parking for adjacent neighborhoods. There are also routes for pedestrians and bicycles (and scooters, presumably) to get to the fest. 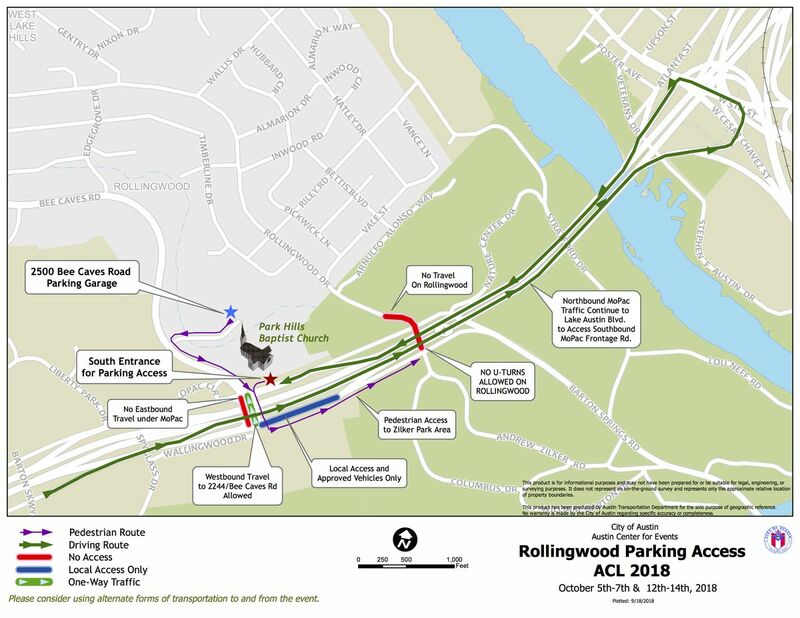 Note: There is no parking at Zilker Park for the ACL Festival. Okay, hopefully you’re convinced not to drive your car to the festival. There are so many better options.